It is very difficult to live in Chicago and not recognize the name Daniel Burnham. We have Burnham Harbor, Hotel Burnham, Burnham Park. There is a yacht club and an elementary school named after him. His name is associated with a number of signature Chicago buildings: the Rookery, the Monadnock, and the Fischer Building are but a few that I particularly respect. Burnham led the team of architects and landscapers that put together the 1893 Colombian Exposition in Chicago. His efforts spearheaded the construction and successful operation of the White City — an event that brought Chicago back from the ashes of the devistating fire just over twenty years earlier. And in 1909 Burnham and his co-author Edward H. Bennett published “The Plan of Chicago.” The plan was the first of its kind: a broad view of the city to organize its design, its look and its structure. The 1909 Plan of Chicago marked the birth of the field of city planning. If you live in the city, it is impossible not to be aware of the plan’s impact: the open lakefront, the grid progression of streets and arterial boulevards, the outer park structure, civic and cultural centers. 2009 marks the 100th anniversary of the publication of the Burnham Plan. As such a number of exhibits and events have been developed to celebrate the Burnham Plan Centennial. 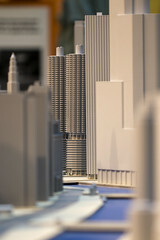 One of these exhibits is the Chicago Model City, presented by the Chicago Architecture Foundation in the Atrium Gallery of the Santa Fe Building, 224 South Michigan Avenue. The exhibit tells the stories behind the planning of Chicago and presents those whose decisions transformed Chicago. What did the planners see? What did the planners imagine? What is fascinating to me about this exhibition is how the presentation provides a much needed element of reflection upon the full meaning of Burnham’s often repeated quote: “Make no little plans; they have no magic to stir men’s blood.” Plans are good; plans are often necessary. Plans provide a framework of accessibility, understanding. Plans provide structure. The challenge that I find myself facing over and over again is to balance the benefits of planning against the vagaries of change. Flexibility, adaptability. Contention with the unforeseen. The survivability of plans once conceived and implemented in the world. As tempted as I am to trot out a series of cliched statements about the benefits and detriments of plans or the lack thereof, I’m going to forego that tact. Instead I’m going to encourage you to visit Chicago Model City for yourself and allow the perspective of a hundred years of modern culture on a large scale to shape your own thoughts on the subject. I initially visited the exhibition to photograph it. I have collected several architectural photographs of Chicago over the years, and I was intrigued by the chance to try and capture these buildings in miniature. But as I reflect on the larger missions of both the Burnham Plan and the centennial I find more interesting, more personal perspectives than those gleaned solely through the camera lens.